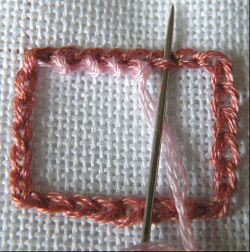 Start by bringing the thread through in the top chain of the left-hand side, and work the first row as for Variation 1, making the first stitch into the second chain of the top row and the last stitch into the eighth chain: seven stitches in total. All rows start from the left, and the thread is darned across the back after every row. Take the thread to the back through the same chain as the previous row. Darn the thread back to he left-hand side again. 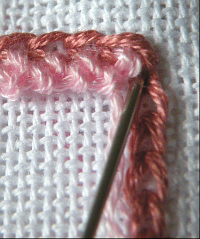 Third row: Bring the thread through the second chain on the left-hand side. 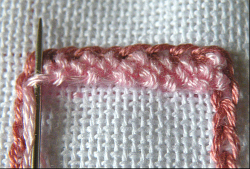 Work the first stitch between the first two knots of the second row and work the last stitch into the bar between the last knot of the second row and the edge chain. 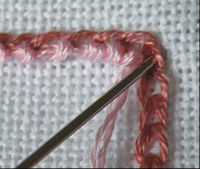 Take the thread to the back through the second chain on the right-hand side. 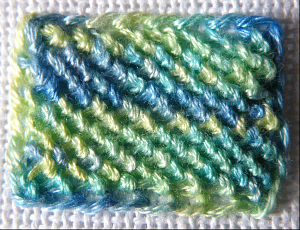 Continue working all even-numbered rows as row two – starting and finishing in the same edge chains as the previous row. Work all odd-numbered rows as row three, starting and finishing in a new edge chain. 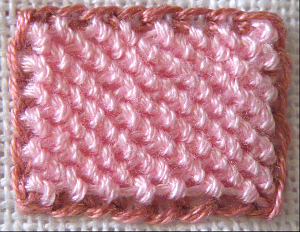 The first stitch of even-numbered rows is made into the bar between the edge chain and the first knot of the previous row, and the last stitch is made between the last two knots of the previous row. 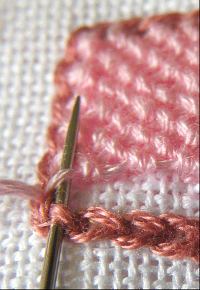 The first stitch of odd-numbered rows is made between the first two knots of the previous row, and the last stitch is made between the last stitch of the previous row and the edge chain. After bringing the thread through for the twelfth and final row, pick up the inner loop of the second chain of the bottom edge before picking up the bar between the edge chain and the first knot of the previous row. 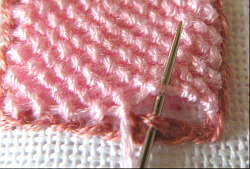 Work the stitch as normal, over the two threads on the needle, and continue along the row, picking up the next chain loop before picking up the next bar between stitches. 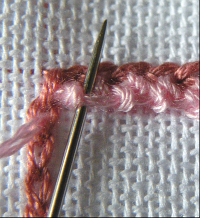 End by taking the thread to the back through the last chain on the right-hand side, and finish off. Maybe it’s just me, but you mean ‘taken’ by ‘darned’ don’t you? I haven’t seen the word used like that before. This is what I mean by ‘darning the thread across’ on the back – picking up some of the fabric to avoid a long loose thread that can catch on things.